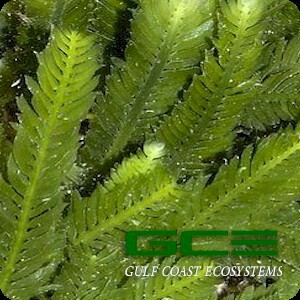 This particular species of Caulerpa is one of the hardiest varieties available for culture in the marine aquarium. C. mexicana has a deep rich green color with beautiful segmented fronds. It grows as small compact fronds in turbulent water, but can extent into larger leaflets in calmer conditions up to 6" tall. Species of caulerpa should be frequently pruned to divide the cells. This species is sold as 1 pint.